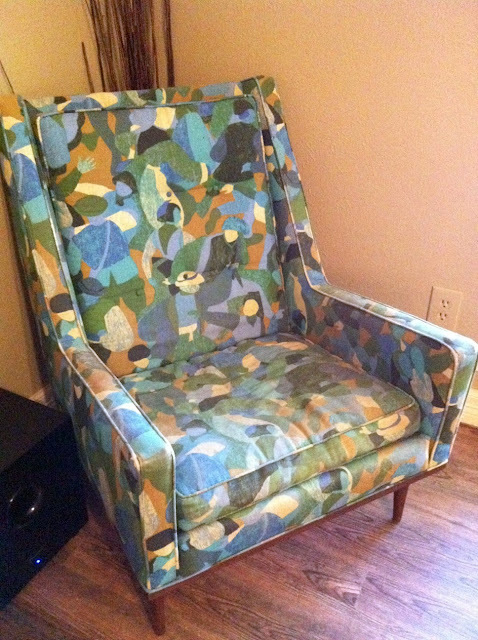 We're making progress on the reupholstery of my vintage chair, seen HERE. My mom found a local woman who was willing to make slipcovers for the chair! I'm really excited about this option because the nuggets absolutely love this chair, and having the option to wash the slipcovers is ideal. Yesterday my mom started texting me pictures from the local fabric store to see what I would want for the "fun" option. I'm so proud of my mom for knowing how to text and send picture messages! And, in case you're wondering how much fabric a chair like this would need, the answer is 6.5 yards (which makes sense when you consider the cushions have to be recovered separately). In fact, this is the exact view you would have if you were sitting in the chair. Anyway, I know things don't have to be matchy matchy, but I would prefer they coordinate and not clash. "Wait, that's some bright yellow chevron, and it's on a really big scale. That might be too much." "What about those brown options? Nah, I don't love any of them..."
"What's that yellow geometric print hiding at the bottom of the pack?" "Ooh, I like that one. Is that yellow and grey?" After a lot of mental debate inside my own head, I decided on the yellow geometric print. As my mom said, "It's timeless and fresh at the same time." I'm pretty excited about it! To wrap it up, the woman has promised to make two slipcovers– one with a neutral fabric and one with this yellow print. I'll be able to switch them whenever my heart desires, which is great because I plan to keep my beloved bargain chair in the family for a long time. My mom said the woman got very excited when she saw my chair, so I like to think she appreciates mid-century design and will do a good job. Time will tell! We're hoping to have the chair back at the beginning of July, since she is booked solid until then.